Morocco is more than olive groves and date palms, sun-drenched bazaars and twisting alleyways in medieval medinas overflowing with a bewildering array of handicrafts, and apothecaries touting herbal remedies with colourful spices heaped into perfectly shaped pyramids. Morocco is a land of diverse people and landscapes, a rich heritage of nomadic Berbers, Roman conquerors, Muslim Arabs and French colonialists and boasts more than its fair share of cultural treasures. Our tour is leisurely with 4 nights in Marrakech and day trips to laid back Essaouira with a vibrant blue-and-white medina enclosed by fairy-tale, sand-coloured ramparts and imposing stone gates and to Ait Ben Haddou, a UNESCO World heritage site, where many famous movies were shot. 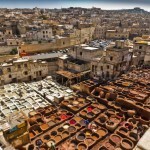 We have 3 nights in Fez, ample time to see the highlights including a visit to the famous tanneries and a cooking school to recreate some of the taste memories of a truly amazing trip. Come and join us – you’ll be so glad you did! Day 1 17 May, 2020 Arrive Marrakech. Use your frequent flyer points or we will find the best airfare for you and team you up with others in the group who are on the same flight. Tonight meet your Australian tour escorts and fellow travelling companions over dinner at the hotel. Dinner is included tonight. 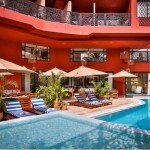 Accommodation: 2Ciels Boutique Hotel and Spa (or similar) 4 nights. Our hotel is ideally located in the heart of the city, surrounded by the exclusive Hivernage and the legendary Gueliz. An urban oasis with a chic and refined interior, art deco style with the master touch of local craftwork, designed exclusively for the hotel. The hotel is strategically located, a short walk away from the mythical Place Djamaa El Fna and cultural tourist attractions, near the famous Mohamed V Boulevard and in front of Royal Tennis Club. Day 3 19 May, 2020 Marrakech – Ait Ben Haddou – Marrakech After breakfast we begin our full day trip from Marrakech to Ait Ben Haddou. We travel through the magical Atlas Mountains, Berber villages and cross the Tizi n’Tichka mountain pass with short stops for photos. 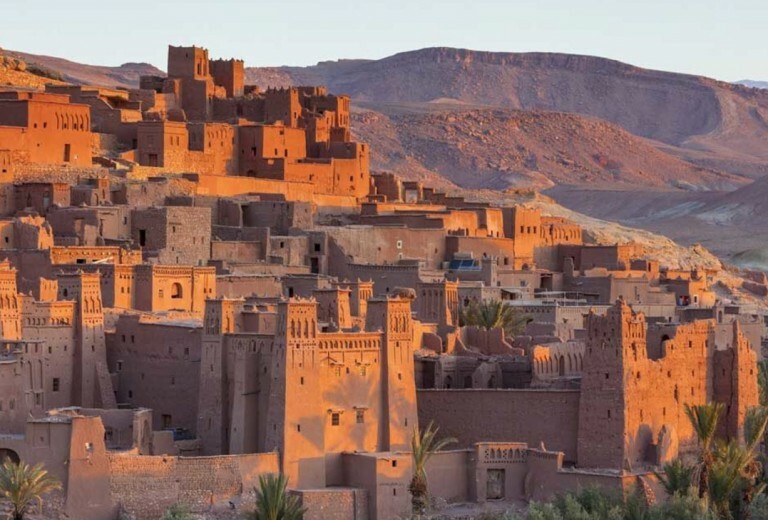 Visit the beautiful Kasbah Ait Ben Haddou, a UNESCO World heritage site, where many famous movies were shot some of which include The Last Temptation of Christ, Kundun, Salmon Fishing in the Yemen, Lawrence of Arabia, Gladiators and part of the TV series Game of Thrones. 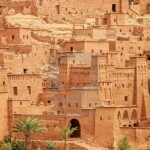 Ait ben Haddou is more than just a film set, though; it is a ksar, a fortified village whose history goes back almost a thousand years, although the maze of narrow and crenellated towers you see these days are mainly from the 17th century. As a strategic stop for caravans of camels, often numbering hundreds, on the trans-Saharan trade route from the Sudan to Marrakech carrying gold, silver and slaves and returning with salt, it would have been a thriving town, home to thousands. Following lunch at traditional restaurant we have some free time before returning to Marrakech. Lunch is included. Day 4 20 May, 2020 Marrakech – Essaouira – Marrakech After breakfast we begin our full day tour to The Blue City “Essaouira”, formerly named Mogador. 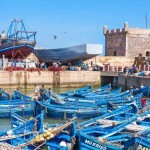 This is a charming city on the Atlantic coast of Morocco with a beautiful fishing port and an amazing sandy beach. We travel through vast fields of argan groves, and visit a Women’s Co-operative manufacturing this famous product. 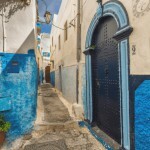 We arrive at Essouira and walk through alleyways of the old medina, visit the jeweller’s quarter, a handicraft complex and a small souk in the middle of the town. After lunch (own expense) we’ll explore the old fishing port with blue boats and colourful flags, and have some free time before returning to Marrakech. 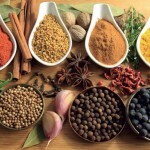 Riad Fes – Relais & Châteaux is renowned for its luxury, impeccable service and fine restaurant. 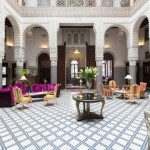 Restored to its original glory, Riad Fès is located in the heart of the ancient city of Fez. It has succeeded in combining refinement with inspiration and invites you to relax and enjoy your stay in a serene atmosphere with decor reminiscent of Arabian Nights. Riad Fes provides guests with the opportunity to travel back in time and enjoy the splendour and authenticity of the lifestyle of Fassi nobility. The prestigious history and refined civilization of this Imperial city are reflected in the Spanish Moorish architecture and attention to detail seen in the decor. With spectacular views of the Medina and the Atlas Mountains, Riad Fès offers a fine dining restaurant that should not be missed when visiting Fez: l’Ambre. A haven of purity and tranquillity created by the designer Christophe Pillet, our Spa Riad Fès by Cinq Mondes invites you to enjoy a unique experience in luxurious and comfortable surroundings. With a selection of the best treatments, massages and traditional formulas marked by Quality, Authenticity and Ceremony designed and developed by Cinq Mondes, our Spa will take you on genuine Sensoriel Journeys. Day 6 22 May, 2020 Fes Fes (or Fez) is the country’s oldest imperial city, a time-worn centre for culture and learning, with colourful tiled palaces and centuries-old souks. 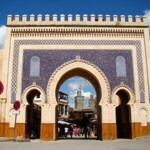 We’ll begin our tour from Bab Boujloud, one of the ornate gates which welcome travellers into the Medina. The Medina is a World Heritage Site riddled with passages that see far fewer tourists than those of Marrakesh. Its alleyways are narrower, making it impossible not to get caught up in the ebb and flow of life passing through. Prepare to lose yourself in the mêlée, while doing your best to take it all in – from the sight of women carrying dough to the communal bakery, to the butcher shaving the fur from a cow’s head with a razor. We’ll visit the highlights of this fascinating city and after lunch (own expense) we visit one of the city’s famous tanneries. We observe the workers from a lookout and see how leather has been processed for centuries. Talk with a tanner and get in-depth insight into the different steps of the tanning process. You may even end up haggling for a bag or a new belt. 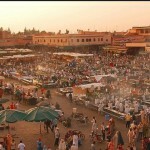 We then venture outside the Medina where the Royal Palace lies, and walk through its large plaza lined with palm trees. We finish today’s sightseeing with a trip to the Bab Fettouh cemetery, where you’ll enjoy a panoramic view of the city, the hills, and the expansive sky. Evening is at leisure. Day 8 24 May, 2020 Fes – Casablanca This morning we drive back to Casablanca where we’ll spend the last night of our tour. 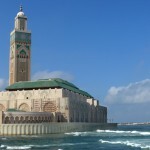 We view the main sights of the city, including entrance the Hassan II Mosque with its wonderful architecture and detailed mosaics. We have lunch at a local restaurant before continuing our drive along the tree-lined streets designed by the French in the 1920s. Stop to admire the ornate exterior and gates of the Royal Palace; see the Mehkama courthouse; and if time permits, enjoy some free time to stroll along the Ain Diab Corniche, Casablanca’s palm-dotted promenade. Lunch and dinner are included. Accommodation: The Kenzi Tower Hotel (or similar ) overnight The hotel is located in the trendiest and most vibrant downtown setting of Casablanca, Morocco’s economic capital. Ideal for browsing in the shops and only just half an hour away from the Mohamed V International airport, the hotel has impressive views of the Atlantic and the city. Day 9 25 May, 2020 Casablanca Sadly our tour has come to an end this morning. For those joining our tour of Portugal and the Azores which commences today, we will transfer to the airport to join our flight to Oporto. We would be happy to assist with your onward travel arrangements.